When my kids asked the other day what was for dinner and I replied "Mexican tortilla stack", they asked what that was. My easiest explanation was that it's like a Mexican-flavoured lasagne but made with tortillas instead of lasagne sheets. My version is an amalgamation of a few different recipes which I've experimented with over the last few months in my hopes of replicating a delicious meal I had at a cafe one day last year. I think this one is pretty close - maybe even better! After taking a few mouthfuls, both my husband and my 5-year old daughter gave it the thumbs up, and my daughter said, "Mummy, this is so yummy, you should add this to the list!" referring to a list of yummy dinners that she would love me to make every day. Preheat oven to 200C. Line the base of a round springform pan with baking paper (I put the baking paper over the base before clipping the rim into place so that the baking paper is held in place by the rim) then grease the whole pan. Brown the mince in a frypan then mix in the taco seasoning and tomato paste. If the mixture is a little too dry, you can add a bit of water to give it a bit more of a saucy consistency (but not too watery). Remove from heat and set aside. Melt some butter in a frypan and cook the mushrooms and spring onions until softened. Remove from heat and stir in the sour cream (depending on how moist your mushrooms are, you may need more or less sour cream - you want the sour cream to just coat the mushrooms but not be too wet or too dry). 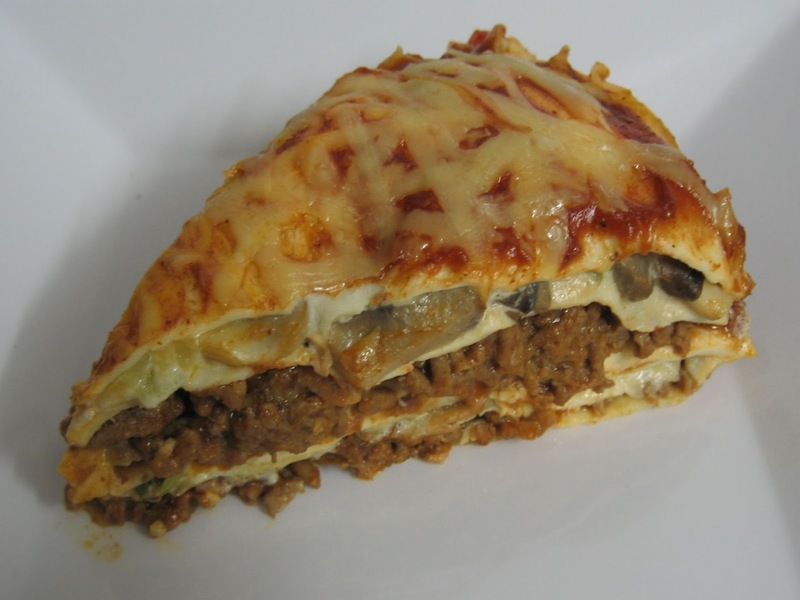 To assemble the tortilla stack, place a tortilla in the springform pan and top with half of the mince mixture. Spread some enchilada/taco sauce over the meat and sprinkle over a small handful of grated cheese. Top with another tortilla. Spread half of the mushroom mixture over the tortilla and sprinkle with a small handful of grated cheese. Spread the next tortilla with a tablespoon or two of refried beans then place it on top of the mushroom layer. Top with another tortilla. enchilada/taco sauce and the remaining grated cheese. Bake in the oven for around 20 mins, or until the cheese on top is melted and golden. Cut into wedges and serve with salad or vegies.